for an Amazing New Year. 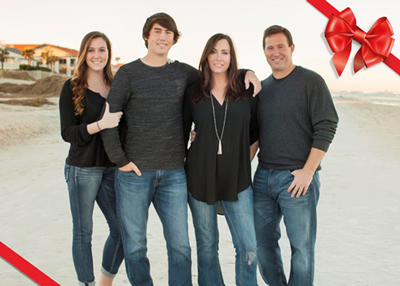 May God bless you, your family and your work! I believe I have found the key to happiness and success and it can be observed first hand in millions of homes and children's hearts this holiday season. The key is to be like a kid on Christmas morning - Thankful for the gifts you have received and optimistic and excited about the new gifts that are coming your way. It starts with being grateful. When you are grateful for the gifts in your life, big and small, you always seem to find more things to be grateful about. That's why abundance will flow into our life when gratitude flows out of our heart. But what about my desire for a promotion, a better job, more money, more friends, better health, more success you might ask? Isn't it important to strive for more? Doesn't gratitude breed contentment and stagnation? How can I be thankful when I know my life can be so much better? That's why it's important to also be optimistic and excited about the new gifts that are coming your way. Sure you are thankful for what you have but you also look forward to more gifts in the future. You believe that your best days are ahead of you, not behind you. When people ask you how things are going you say, "Getting better every day." This was something I learned a number of years ago. At the peak of my misery, struggles and failures I realized I had to stop being disappointed about where I was and needed to start looking forward to where I was going. Once I started being thankful for the simple gifts in my life and became excited about the road ahead I experienced a completely different journey. When you change your heart and mind you change the direction of your life. So what are you thankful for? What is right about your life? Be sincerely grateful. Then think about what your brighter and better future looks like. What do you hope for? Trust it is possible. Get excited. We often think that we'll get excited about life when we have a life that is exciting but actually it works just the opposite. When we get excited about life, we get a life that is exciting. In this spirit may you experience amazing gifts this holiday season and may your 2017 bring you even greater gifts than you could imagine. 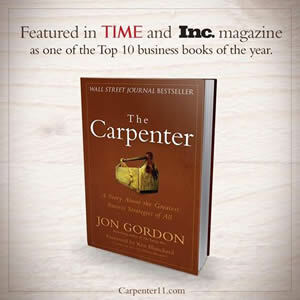 In the spirit of giving this Christmas / Holiday Season, we have selected 10 subscribers to Jon Gordon's newsletter (selected at random) to receive a complimentary copy of The Carpenter. *Winners notified by email for their mailing address.